In this third part, the last of a three part series, the author stresses that in order for a policy “review” or annual statement to rise to the level of a true “audit”, it needs to incorporate all elements of the above criteria. It needs to do this in a format providing actionable information. Without actionable information, a “review” cannot be meaningful in a dispute. The audit will include a rate class assessment, sustainability review and gathering of policy data. The audit report will include an Executive Summary, an Action Plan with performance summaries, policy detail analysis, and carrier rating analysis. In Part 1 of this series, I said that the analysis needed for most life insurance policies is to determine viability, not value. Unfortunately, the vast majority of what is purported to be a “policy audit”, is in fact no more meaningful in determining viability than the annual statement every policy owner receives directly from the carrier. For a policy “review” or annual statement to rise to the level of a true “audit”, it needs to incorporate all elements of the above criteria. It needs to do this in a format providing actionable information. Without actionable information, a “review” cannot be meaningful in a dispute. The policy your client thinks they have, may not be the one they actually own. Without a comprehensive policy audit, including actionable information, this situation may never change. Every insured’s medical history changes over time. It is important to assess what effect the medical changes will have on how the client might be treated in formal underwriting by carriers. This can limit or expand opportunities to minimize costs. If a client’s rate class has worsened, the policy being audited may be significantly more cost effective than alternatives. In contrast, if a prior condition is now treated more favorably by carriers, or has become benign (see Part 2), more cost-effective opportunities may present themselves. Rate class assessment begins with the client completing a medical questionnaire. An experienced underwriter speaks with the client to determine if the information provided is sufficient, or warrants further investigation. If additional information is needed, the client’s medical records (with their authorization) may be ordered and reviewed. No physical examination is necessary at this stage, nor are any tests needed. Informal inquiries are made to carriers for tentative rate class assessment. This informal process has proven to be more than 90% accurate in determining the probable rating class for clients prior to taking a physical, blood tests, or going through formal underwriting. If there is a single most important element of a policy audit, it is the suitability review. If an audit focuses on policy cost without considering its suitability for stated objectives, it may be without merit. In the investment industry, the SEC (Securities Exchange Commission) and FINRA (Financial Industry regulatory Authority), make suitability the most important consideration in recommending an investment. 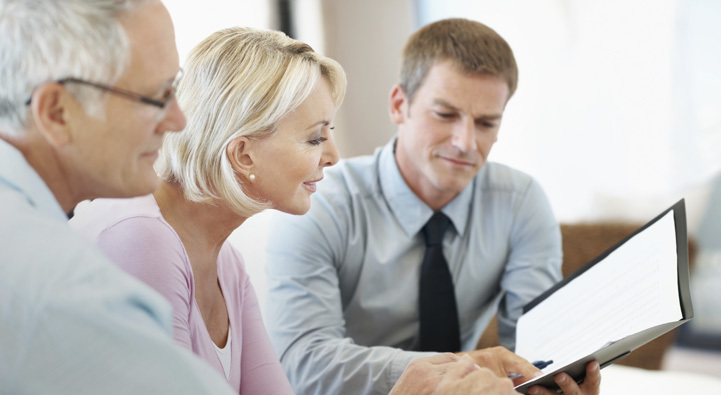 For trust owned life insurance, the OCC specifically references suitability and the UPIA refers to appropriateness, when discussing a trustee’s fiduciary responsibilities. Information gathered is reviewed to determine the suitability of the coverage for the client’s objectives. If necessary, and with the client’s authorization, their attorney may be consulted for clarification of specific points. Gathering the right policy data is integral to minimizing costs, maximizing benefits, determining suitability, and creating a plan of action. Not surprisingly, few people obtain the necessary information for a full evaluation of a life insurance policy. Mostly this seems to be due to a lack of understanding regarding how different pieces of information can become important throughout the analysis. Sometimes it is just because it is quicker to gather only the basic information. Extended maturity (coverage beyond age 95 or 100) and requirements to secure the same. Today it is a reality that our clients may live past age 100. The audit report discussed later in this article was prepared for a policy with a “cost-of-living” rider, which significantly impaired its cost-effectiveness. Cost basis and gain position. The premium history, dividend option and cost basis were pieces of information that saved one client $1,000,000 in unnecessary tax liability (see Part 2). The cost basis raised a red flag, the premium history explained the problem and a proposed policy exchange was halted, avoiding the tax recognition. In force illustrations. Typically multiple illustrations are obtained to determine various funding options to maintain and/or improve coverage. Only after assessing the client’s rate class, reviewing suitability of the coverage, and gathering data for the policy, will the audit analysis begin. At this point, the pieces of the puzzle come together to form a picture that will make up the audit report and eventual action plan. What follows is taken from an actual policy audit report, with identifying information for the client and carriers removed. The summary below is an example of what an audit may reveal for a policy maintained as a requirement of a divorce settlement agreement. The owner’s stated objective could be summed up as “maximize cost effectiveness”. These facts, disclosed as a part of the suitability review, were integral to helping this client. The audit determined that the cost-of-living rider, due to no automatic mechanism to increase the outlay, was eroding the policy’s value and reducing its cost-effectiveness. Guideline premium limitations prohibited the premium from being increased enough to maintain the coverage to maturity. Multiple scenarios to improve cost-effectiveness were explored for the existing policy and with potential replacement carriers (determined as a result of the rate class assessment). The most cost-effective was “Alternative #1” in the chart below. Its combination of premium and coverage for life could not be matched by the current policy. If the client decides to pursue recommended modifications (in this case Alternative #1) an action plan has been provided to guide them. 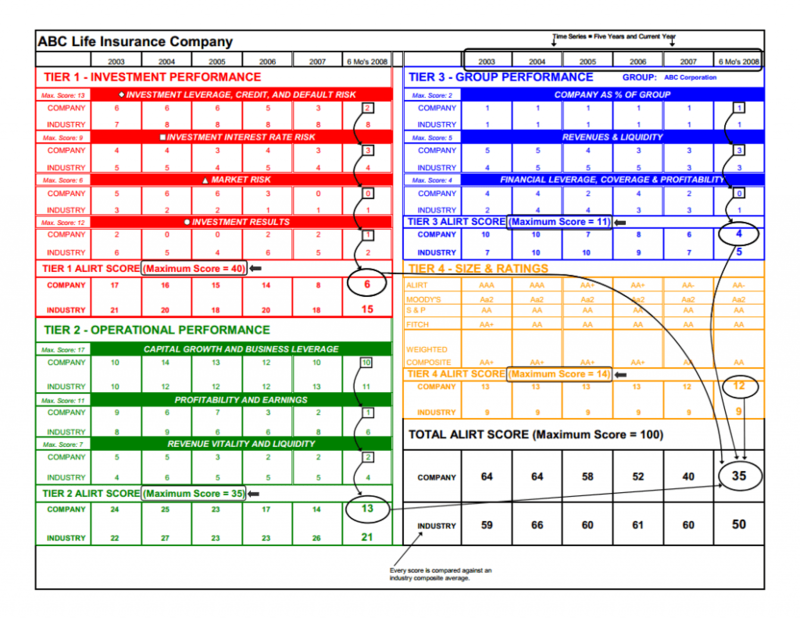 A performance summary for the subject policy is prepared. Such summaries are also prepared for each modification or alternate scenario in direct comparison to the subject policy. As seen in the chart below, policies are analyzed at life expectancy, and five years before and after (in this case ages 82, 87, and 92). While this chart is based on projected (non-guaranteed) values, in another chart, guaranteed performance is also reviewed. The right hand columns of the chart show the IRR (rate of return) at death. 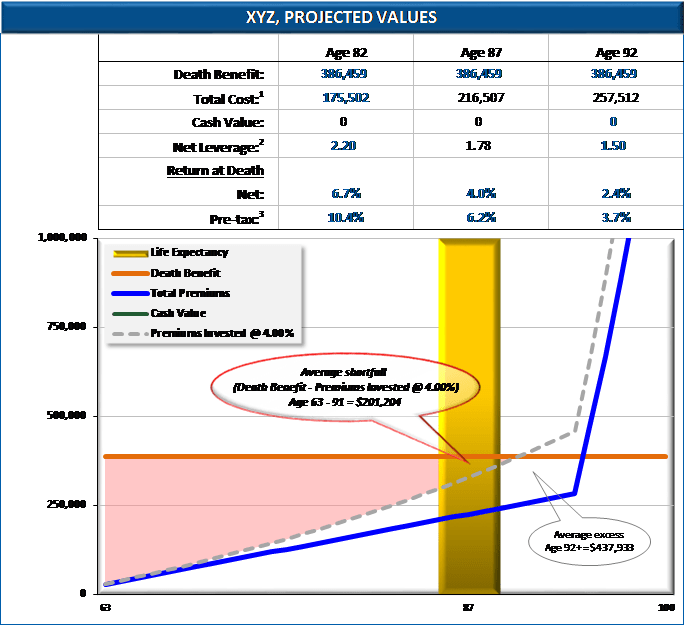 Since life insurance death benefits are generally received free of income tax, an approximation of a pre-tax equivalent, is given for comparison to other investment opportunities, which is illustrated later. Values (death benefit, premiums, and cash value) for the subject policy, modifications to the same, and alternative options are graphed to show their progression before, during, and after the life expectancy range (-5 years to +5 years), represented by the gold column in the below chart. This is compared to an arbitrary investment earning 4.0%, to determine any shortfall or excess vs. the death benefit. A synopsis is provided of the financials of each carrier mentioned in the report, and compared to the average for the 100 largest life companies, representing over 80% of total industry invested assets. 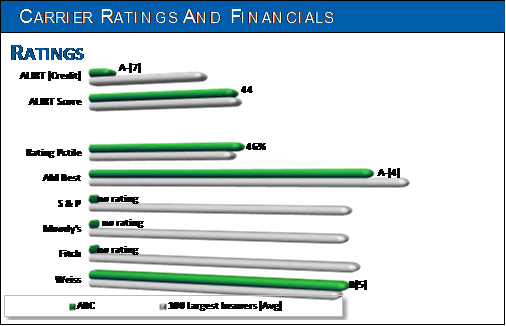 A rating from the major rating services is given along with ALIRT, a rating service usually familiar only to insiders of the insurance industry. ALIRT is a proactive service monitoring the financial performance, quality, and stability of life insurers for institutional stake-holders. ALIRT uses historical comparative analysis, rating agency biases, and benchmarking ranges to provide a credit rating and financial performance score. Continual monitoring assures notification if significant changes occur. A comprehensive policy audit provides an in-depth analysis of a policy and the carrier securing the benefits. More importantly, it provides actionable information to help maximize the probability of a successful outcome, meeting the policyholder’s objectives. The report documents a prudent process to help fiduciaries meet their responsibilities. Sharing the report with beneficiaries may avoid conflicts. If a dispute should arise, the audit report provides evidence of due diligence and a rationale for the game plan followed. In summary, the audit report makes sure that the policy your client thinks they have, is the one they actually own. Gary DeVicci, MSFS, CFP, heads CPI Companies’ planning team, with responsibility for the suitability elements of their PolicyAudits.com services. PolicyAudits.com is designed to help policyholders save money and improve their benefits or guarantees. It is independently operated on behalf of the policyholder; it is not allied with any life insurance company. Mr. DeVicci can be reached at garyd@cpicompanies.com or at (856) 874-1250.